A technique for viewing images in three dimensions (3D) that works without the need for specialized glasses is demonstrated this week in Nature Communications. This autostereosopic technology could be useful in flexible displays and has commercial applications. Kookheon Char, Khap Suh and colleagues use modern microfabrication techniques to create arrays of polymer micro-prisms. When placed on a screen the prisms guide light in a way that gives a perception of depth by presenting offset images to the left and right eye. 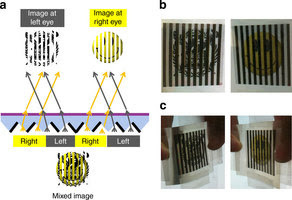 The prisms also work in flexible displays, and could be an inexpensive alternative to other autostereosopic 3D display technologies. Directional and asymmetric properties are attractive features in nature that have proven useful for directional wetting, directional flow of liquids and artificial dry adhesion. Here we demonstrate that an optically asymmetric structure can be exploited to guide light with directionality. The Lucius prism array presented here has two distinct properties: the directional transmission of light and the disproportionation of light intensity. These allow the illumination of objects only in desired directions. Set up as an array, the Lucius prism can function as an autostereoscopic three-dimensional display.